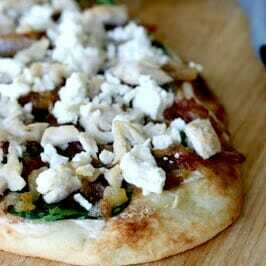 Sweet caramelized onions and tangy feta combine beautifully to make this easy and yummy flatbread pizza. Cooked chicken, rotisserie chicken, fauxtisserie chicken, pre-cooked frozen strips, baked, etc. Layer the above ingredients on flatbread and cook in a 400 degree oven for about 10 minutes. Slice and serve! Important Tip: I actually have been meaning to do a whole post on the different methods of caramelizing onions, because there are a few ways to do it. But for right here and now, if you’ve never done it before, just thinly slice onions and saute them in a skillet on med-low heat with a couple of pats of butter. After about 15 minutes when they’re nice and soft add a sprinkle of sugar (either brown or white) if you want to enhance the sweetness. Continue cooking until they’re caramel colored. It can take 20-30 minutes depending on the heat of your pan and the thickness of the onion. You could make them ahead of time and just store them in the fridge.